More than 4,000 health care facilities in the U.S. have pledged to become mercury free. If your facility is still using mercury-containing products, here are suggested steps you can take to address this problem. Be Recognized for Your Mercury Elimination Efforts! Hospitals must first take an inventory of the mercury-containing products they currently purchase or have in stock. There are several good tools hospitals can use to identify mercury-containing products in their facility. 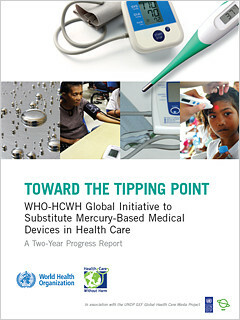 Health Care Without Harm has developed a List of Mercury-Containing Items in a Hospital Setting (pdf). The MWRA / MASCO Mercury Management Guidebook provides a database of mercury-containing items as well as resources on mercury in wastewater. The Mercury Assessment Worksheet was designed to help organizations inventory their mercury-containing devices. This spreadsheet was developed by the California Office of P2 and Technology Development and the California Department of Health Services' Hospital Pollution Prevention Program. See Sections 5A and 5B of the Mercury Checklist (pdf) from the Hospitals for a Healthy Environment (H2E) Self-Assessment for Facilities. Once the inventory is complete, the next step is to create and implement a mercury-free purchasing policy. Having a hospital or system-wide policy to eliminate certain types of toxic products is beneficial because administration, clinicians, material managers, and purchasing agents are all working under the same guidelines about what not to purchase. Here is a sample mercury-free purchasing policy. Defining small goals and achieving them creates momentum for the program and keeps staff engaged. Mercury elimination efforts should be documented and can be used as a Performance Improvement Initiative for JCAHO. Cost-effective alternatives exist for virtually every mercury-containing product used in the health care setting. The key to a smooth transition away from mercury products means coordinating with Purchasing/Materials Management to make sure they are aware of the alternatives to mercury products. Find more about mercury-free alternatives. Practice Greenhealth, a partner organization of Health Care Without Harm, recognizes outstanding efforts in environmental improvement with its annual Environmental Excellence Awards.